Discussion in 'Health News and Research unrelated to ME/CFS' started by Esther12, Apr 11, 2019. Given the media coverage, Science Media Centre spin wouldn't surprise me, but no sign of it yet. Are we now going to get some pained articles about "all we did was conduct a trial likely to exaggerate any benefits of psychological therapies and then promote our results to the media with anecdotes about how life-changing our treatment was... how could that have led to appalling headlines about how the answer to IBS is 'in the mind'?!" MEMarge, Sarah, hinterland and 21 others like this. 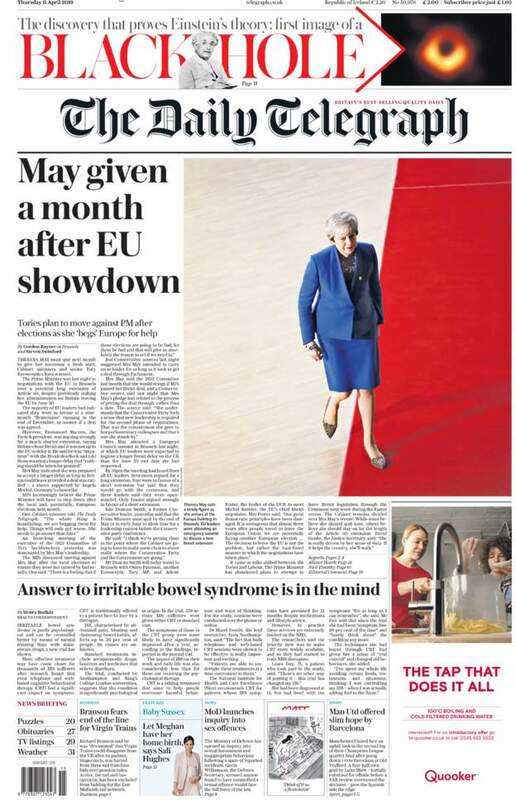 Front page of the Telegraph! Whoever would have guessed that a study by Prof Chalder would conclude that CBT is an effective treatment. I wonder if someone could do a study to determine whether her unhelpful beliefs can be reversed with CBT. Perhaps Prof Chalder could conduct the study herself. The Chalder Paradox: Is CBT an effective treatment for reversing unhelpful beliefs about the effectiveness of CBT? I think maybe we should write this up as a spoof paper. Medfeb, LadyBirb, shak8 and 34 others like this. Surely the answer to everything is in the mind? It's almost definitely not in that rock over there, or that blade of grass next to it, or in a toenail. These things do not contain answers, they don't even contain questions. Only minds can come up with and understand answers, so the answer to everything must, by definition, be in the mind. I'm much more interested in that tap that can do 'everything', also on the front page, that probably can't even tap dance whilst baking a nice cake. False advertising or what. Keebird, MEMarge, hinterland and 12 others like this. Well, initially I was most interested in the black hole image; I'd heard that the image would prove things either way, so, nice to see the picture. But I hadn't seen the tap. You are right @Wonko, the most interesting news on the page is about the tap that does everything. 2kidswithME, MEMarge, Wonko and 8 others like this. has @#meaction considered a program of connecting with ibs charities, and charities representing every other population that is being attacked? @JaimeS? for example an email list that charities are subscribed to that has petitions that can be signed [at their option] + press kits in response to and anticipation of attacks. and also a program for educating one another. i /don't want/ to keep seeing disease after disease and disease-state after disease-state being attacked and not being active. alktipping, Inara, Estherbot and 7 others like this. No mention of an expert reaction section though. Simbindi, ladycatlover, wdb and 3 others like this. The new trial, conducted by Southampton and King’s College London universities, suggest that the condition is significantly psychological in origin. Doctors studied 558 serious IBS sufferers who were either put on a programme of CBT or received standard care. But didn't the psychosocial crowd tell us that the fact that an illness is ameliorated by CBT says nothing about whether it is psychological in origin? Snow Leopard, JohnTheJack, MEMarge and 10 others like this. So whilst it might be said, by some, that CBT is more effective than treatment that had been shown over at least a year not to work, what it definitively doesn't show is that CBT is more effective than IBS treatment that works. Which is the implication in the headline. It's not even an implication, it's a statement. Then of course there's the whole phone, internet treatment thing, which I believe has been discussed before. 2kidswithME, rvallee, ladycatlover and 5 others like this. Medfeb, shak8, 2kidswithME and 10 others like this. shak8, MEMarge, EzzieD and 7 others like this. Given the amount we get fed every day that's quite unfortunate. Inara, shak8, 2kidswithME and 14 others like this. Has she never heard of Celiac ? Lactate intolerance? etc. What about the Pret incident? Almost all allergies start with IBS along with cancer of the bowel? If Pret can be torn apart then this research has to be held accountable for the suffering and deaths it will cause? On average it takes 13 years to be diagnosed with Celiac and by that time all the villi can be burnt to such a degree they no longer can or will take any vitamins or minerals in. This is vital to know for very young children. Inara, Samuel, 2kidswithME and 10 others like this. Clinical effectiveness will be assessed by examining the difference between arms in the IBS Symptom severity score (IBS SSS) and the Work and Social Adjustment Scale (WASAS) which measures participants ability to function and live their lives) at 12 months from randomisation. Cost effectiveness will combine measures of resource use with the IBS SSS at 12 months and QALYs. This trial will assess the clinical and cost effectiveness of CBT for IBS in a well designed rigorous study with a long term outcome. This will enable clinicians, patients and health service planners to make informed decisions regarding the management of IBS with CBT. It seems to have the same issues as PACE in terms of subjective outcomes. Not only do they not learn that such approaches don't give reliable results but the NIHR who fund the trials equally don't seem to get the point (or allow reviewers to be chosen who run equally poor trials). As academics they are somewhat stuck in that they run CBT for anything trials because that is all they can do. shak8, 2kidswithME, Lisa108 and 17 others like this. My involvement with the ACTIB trial has made me aware of the psychological effect of my IBS. I feel that, to a great extent, I can manage the condition and I have minimised the impact of IBS on my life, without the cost of medication or medical consultations. IBS is not controlling my life. To me that is saying there has been no change in the IBS symptoms, but she has adjusted the way she thinks about them and feels more in control as a result. (or she has learned that's what you're supposed to say and it's wishful thinking). shak8, Inara, 2kidswithME and 20 others like this. I noted that when describing their outcome measures, they say "IBS-SSS is widely used in IBS studies and a 50-point within-participant change from baseline regarded as clinically significant," and then go on to look at 35 pt improvement in group means instead. While there may in fact be little difference between 'diff in group means' and 'means of individual diffs', it's better to look at the latter if your aim is to achieve individual improvement. I'd like to see the proportions of patients who achieved this 50-pt improvement in each group. I'd also like to see the manuals and the questionnaires to see if they've been 'outcome training' on specific questions from the IBS questionnaires. Snow Leopard, shak8, 2kidswithME and 17 others like this. so if there were any improvements how do they know it is not due to a change in diet? shak8, andypants, Inara and 18 others like this. of course we could have plenty of people in there that don’t actually have IBS. Just judging by the amount of wrong attribution of symptoms to diet I would imagine that they had rich pickings in the selection of the cohort to give them the outcome they wanted. Wally had been avoiding gluten ever since he realised that the bun in his burger and chips left him feeling bloated. Keebird, andypants, Inara and 8 others like this. I'd like to see the proportions of patients who achieved this 50-pt improvement in each group. "Ninety-nine of 136 (72.8%) participants had a clinically significant change in IBS-SSS (≧50 points) from baseline to 12 months in TCBT compared with 82/124 (66.1%) in WCBT and 58/131 (44.3%) in TAU." But my point about possible 'outcome training' is still relevant here. Snow Leopard, 2kidswithME, JohnTheJack and 10 others like this. Moving into the cash grab phase. MEMarge, NelliePledge, Oni and 2 others like this. Not had time to read it yet, not sure if I can be bothered. Oh, and I thought I had IBS for years, but was finally diagnosed with probable diverticulitis at St Thomas Hospital (London) walk in centre (treated with antibiotics), diverticulosis later confirmed by CT colonoscopy back in Liverpool. I wonder if they excluded diverticulosis in their patients. 2kidswithME, MEMarge, Estherbot and 7 others like this.